Non posso fare i compiti!! It is officially one week to Palio and the drums are incessant tonight! I can’t concentrate! 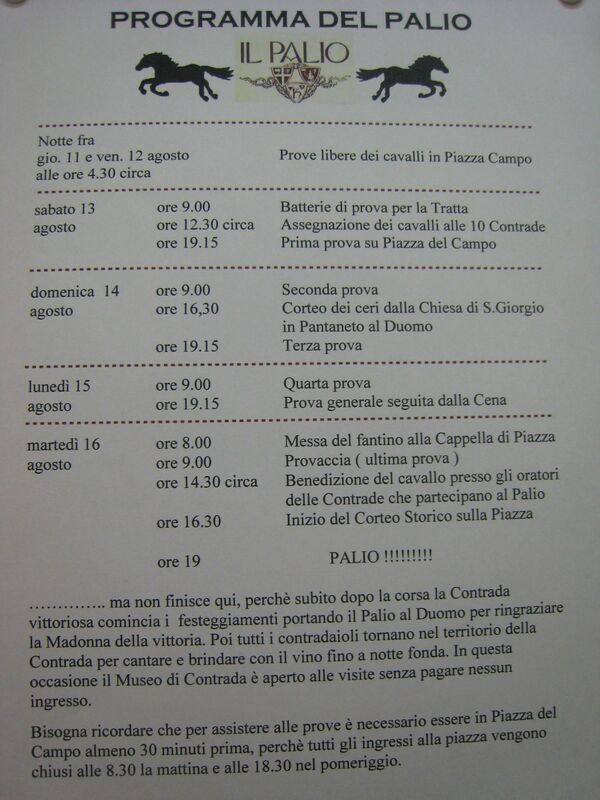 At the school they have posted the Palio agenda…and so it is about to begin! Looks like the first events (trials) are this Thursday and Friday afternoon at 4:30. The day of Palio (next Tuesday), the blessing of the horses starts at 2:30 and that is the official beginning of the pagentry! The race is at 7:00 pm! Monday is a Catholic holy day (The Assumption of the Blessed Virgin Mary) so everyone else in the country heads to the beach, etc., for the long weekend but no one in Siena ever leaves town due to the Palio which is always the day after The Assumption. BTW – you might notice in the photo that sometimes the Italians use commas to differentiate between hour and minute, sometimes they use periods, sometimes neither! Sometimes they use a 12 hour clock, but usually a 24-hour. I have grown accustomed to this which is quite funny! This is similar to their usage of pronouns. For example, there are pronouns used with a small group of male singular nouns in one condition but in another verb tense or usage that same pronoun is used for all male plural nouns; and believe me, that’s just the beginning of it! Crazy people these Italians!! !